Follow Camp Otonabee's Facebook page to see photos and updates from camp! Camp Otonabee provides an opportunity for children and youth to engage in outdoor activities, discover nature and enjoy the natural environment, build self-confidence and establish lasting friendships. 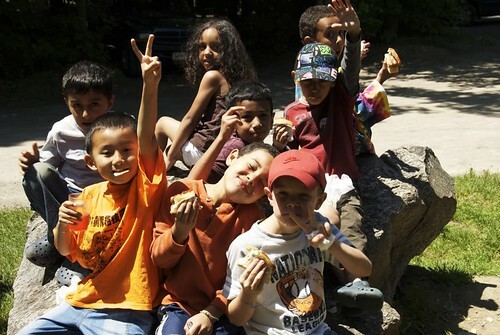 Campers aged 4 to 16 can experience canoeing, rock climbing, kayaking, swimming, horseback-riding and more! Browse through our Camp Guide (PDF) and select the camp program that is right for your child. Click on the links below for additional resources. Y camps are for every child and youth in our communities. Because camp can have a profoundly positive and lasting effect on children, we are dedicated to ensuring that as many kids as possible have access to a YMCA-YWCA camp experience. We provide financial help for those who otherwise couldn't afford the experience and integrate children with special needs while giving them one-on-one support. There is also the Evelyn E Laishley Campership Fund available to support qualifying campers who need financial assistance to attend Camp Otonabee. We are proud to offer supportive programs for participants with special needs and requirements. This program allows campers the opportunity to participate in our camp programs with additional counsellor support ensuring that their experience is a positive one. Each camper will be assessed independently and assigned, with the help of the camper’s family, a one to one or low ratio camper to counsellor experience within our camps ability to provide the necessary support that will ensure a healthy and safe learning environment. Please note that space is limited. To learn more, please contact our camp office at 613-832-1234 or email day.camps@ymcaywca.ca.